Prefabricated House | Piraziz Int. Serv. Sol. What is a Prefabricated House ? The word “Prefabricate” is an English word derived from the words pre (before) and fabricate (construct). This word predicates buildings composed of panel system or modules in prefabricated building sector. Prefabricated moduler low cost houses are supplied complete package including sanitary and electrical installation along with the building components such as wall panels, roof structure,doors, windows etc and if required fully-furnished. Being optimised for off site factory production these buildings reduce cost uncertainty and allow rapid delivery and installation especially for remote locations and mass housing projects in terms of budgets. Piraziz I.S.S. provide standard models as well as doing custom desing projects. 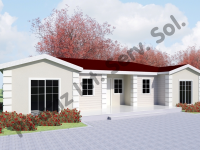 Advantages of Prefabricated Houses Supplied By Piraziz I.S.S. Environment friendly prefabricated houses with low energy cost are designed and produced by taking all kinds of climate conditions in consideration. Prefabricated houses are light and flexible and therefore resistant to earthquake. Our static calculations are made according to 1st degree earthquake zone. The production and assembly time of prefabricated houses are very short compared to reinforced concrete houses by means of sophisticated production technology and lines we use. This means less labor cost. There is less material consumption during the production and assembly of prefabricated houses. 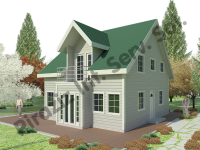 Prefabricated houses can be dismounted and remounted many times. Comprising an alternative to reinforced concrete construction system, these systems are long-lasting. Low-cost prefab houses or high quality villas are designed and produced by taking requirements of every customer group in consideration without any compromise from quality. Although we give our customers an opportunity to select from our standard house plans, we can also design and produce prefabricated houses in the direction of their own designs. We can produce in single storey 2-storey; and now with our new investments in technology we can design and produce prefabricated buildings upto 8-storeys. Prefabricated house load-bearing system is created by using galvanized steel rolls covered with low-carbon zinc proper to cold forming and produced according to DIN EN 10346:2009 standards and light steel C, U, Z, sigma, Sigma plus, C plus, H profiles and special truss profiles in the direction of design. Galvanized structural steel in DX51D+Z, S250GD+Z, S320GD+Z, S350GD+Z quality are used in prefabricated houses in the direction of design and static calculations, and bolted union is used in connections. Produced within the body of our Holding company which is the first fiber cement board manufacturer in Turkey, HekimBoard branded, A1 class (EN 13501-1, CE certificated) fiber cement boards are used in our Standard production system as cladding of prefabricated houses. These environment friendly boards produced in natural materials do not contain asbestos. As a good insulation material, these boards are not effected by temperature difference between day and night. It is possible to design traditional and modern facades in prefab houses with selections of different patterns and thicknesses. Insulation materials, electricity, sanitary installation materials and other building elements used in prefabricated houses are provided from materials proper to Turkish Standards.